Question: I see you are an avid shopper like myself, I was wondering what you did with your purchases while traveling? Did you post them home or carry them with you? If you mailed them home do you have any advice on the cost of mailing parcels from SEA? Any recommended post offices or carriers or things to watch out for? Answer: All my new purchases were sent home, I didn't carry them around (except for extra fragile things). I sent a package from Jaipur in India after a whole day of shopping. There wasn't room in my backpack and it would have been heavy :S I also sent two packages from Bangkok (one by air and one by ferry). It's a lot cheaper to send them with ferries but usually takes 2-3 months. The one by air arrived less than a week. The one by ferry cost me 2900 B (12 kg) and the one by air (2450 B) -- 5kg. The prices is determined by destination, weight and transportation (and maybe company, I'm not sure). Ferries are the cheapest (but the slowest). I shipped these from a small office offering postal services in Banglamphu, Bangkok. Can't remember the address. 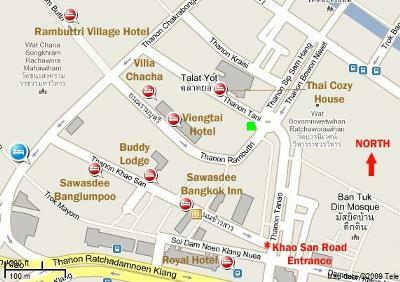 Look at the attached map (look for the green dot) at the end of Soi Rambuttri. Otherwise I don't have the exact amounts of mailing parcels from other places/countries in Southeast Asia. Only send necessary things (new purchases). I did the mistake of adding kilos of old clothing. When I got home I just threw those away :S I could have saved at least 500 B. For more info on Bangkok, click here! Join in and write your own page! It's easy to do. How? Simply click here to return to Forum: Miscallenous.